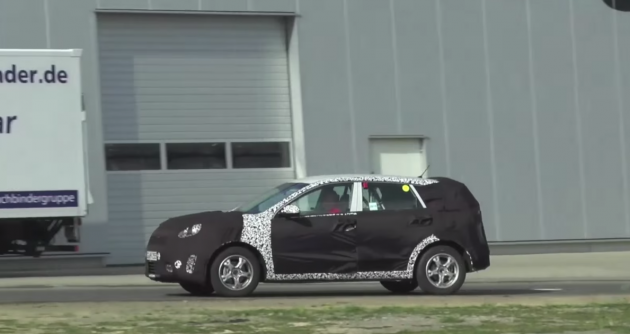 The spies over at autoevolution recently caught a glimpse of the upcoming 2016 Kia Niro running some test laps in Nurburgring. The vehicle is an all-new small hybrid crossover SUV that is set to hit the market in the middle of next year. We also don’t know anything about the Niro’s hybrid powertrain, but the concept came equipped with a 1.6-liter turbocharged engine and an electric drive system that produced 158 horsepower. The 2016 Kia Niro should go on sale in the middle of next year, slotting in right below the Soul in Kia’s lineup. In later years, Kia is expected to release a plug-in hybrid version of the green vehicle. So to summarize, we don’t know what the 2016 Kia Niro looks like, what kind of an engine it has, what kind of mileage it manages, or really any pertinent information. But we do know it’s being driven in Nurburging, and that’s… uh, something, we suppose.